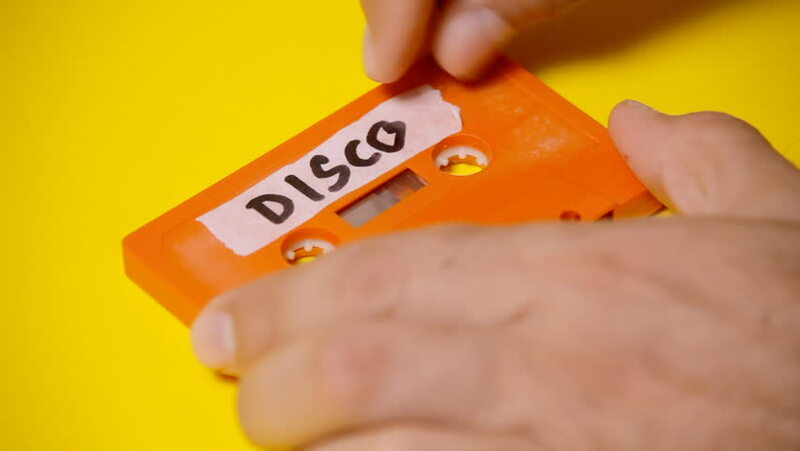 Applying a handwritten label on a vintage cassette tape (obsolete music technology) with the text Disco. Looks like magic but it's a simple reversed shot. Colorful scene. hd00:10Writing the text 1970s on the rough label of a vintage cassette tape (obsolete music technology). Colorful scene. hd00:07Applying a handwritten label on a vintage cassette tape (obsolete music technology) with the text Retro. Looks like magic but it's a simple reversed shot. Colorful scene. hd00:10Applying a handwritten label on a vintage cassette tape (obsolete music technology) with the text 1980s. Looks like magic but it's a simple reversed shot. Colorful scene. hd00:12Applying a handwritten label on a vintage cassette tape (obsolete music technology) with the text Love Songs. Looks like magic but it's a simple reversed shot. Colorful scene. hd00:10Applying a handwritten label on a vintage cassette tape (obsolete music technology) with the text 1970s. Looks like magic but it's a simple reversed shot. Colorful scene. hd00:08Writing the text Electro on the rough label of a vintage cassette tape (obsolete music technology). Colorful scene. hd00:12Writing the text Love Songs on the rough label of a vintage cassette tape (obsolete music technology). Colorful scene. hd00:10Applying a handwritten label on a vintage cassette tape (obsolete music technology) with the text 1990s.